Why Make a Purple Christmas Card? 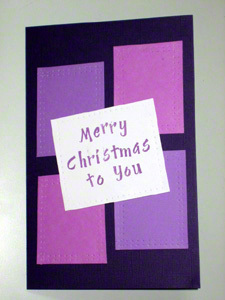 Consider making this purple Christmas card for that person on your Christmas shopping list that loves the color purple. Yes, even though it's the symbolic color for royalty, purple is not one of the many Christmas colors. And that is why this card falls into the category of unique Christmas cards. For that same reason, you'll make that purple lover feel you just gave her or him the best Christmas card ever! May God bless you at Christmas and Always! Use the rubber stamps and purple ink on the lightest shade of purple to create what you want the front of the card to read. The card here reads “Merry Christmas to You” within an imaginary 2.75” x 2” box. The lettering is not aligned on purpose. If you would rather align the text, you can use this cool trick below. To align the text, simply place the rubber stamp against a rigid material like a block when stamping it on the paper. cut out a 3.5 x 3” rectangle with the stamped ink lettering in the middle of the rectangle. Place this rectangular piece of paper on the hole piercing mat. Then use the single hole punch wheel to create a single “stitch” around the rectangle about ⅛” from all the edges. Then place this aside. If you can't find a hole piercing mat, another option is a cork-board. Take the darkest shade of cardstock paper and score it straight in the middle so that it folds into two equal 8.5" x 5.5" sides. Use this cardstock for the main body of the purple Christmas card. Cut out two 2.25” x 3” rectangular pieces of paper from each of the two remaining purple cardstocks. Hence, these equal a total of four rectangular cardstock pieces. Place the cardstock on the hole piercing mat. And use the double hole punch wheel to create a double “stitch” around each of the four rectangular pieces ⅛” from all the edges. Place these four pieces of paper on the front face of the folded cardstock. And align them such that they are offset about ¼” horizontally and ½” vertically from each other. Once you are satisfied with the alignment, pick these four pieces up one by one and glue them in place on the very front of the card. Then pick up the rectangular piece that has "Merry Christmas to You" stamped on it. Then glue it at a slight angle in the middle of the card. And just like that, the purple Christmas card is finished. 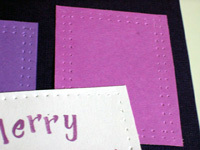 You can use light purple ink or white ink to write inside the dark purple card. Another alternative here is to use a dark purple ink or black ink on a light purple 3.5" x 6.5" cardstock. Then glue this piece of paper inside the card. To add variety, reverse the order of the shades. In other words, use lightest shade for the actual folded card. 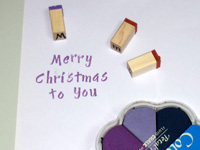 And use the darkest cardstock for the "Merry Christmas to You" part with light purple ink.